After Kimura San, the chef who started Kimura on Rupert Street in Vancouver, sold and left his restaurant I have been looking for suitable “go to” replacement for sushi in East Vancouver. I have a feeling this maybe the biggest futile search, since the creativity, variety (in both fish and cooked Japanese food), freshness and value afforded by Kimura San may have been lightning in bottle and never to be seen again. It doesn’t mean I shouldn’t go looking. I had heard about Hyoga from Wisemonkeys.ca message board and was eager to see if it could become my go to sushi place in East Van. My friend, Speedy Gonzales (Speedy for short) and I put Hyoga through its pace with carefully selected items off their small menu to see how the ingredients and chef’s skills stacked up. The first item that arrived was the chef special assorted sashimi. The presentation, which included chunks of ice to keep the sashimi cold, was gorgeous and showcased the fish in a beautiful fashion. To accompany our fish, we were given freshly grated wasabi, wasabi infused with Yuzu (very interesting as you got a hit of fragrant citrus followed up by the spiciness of the wasabi) and a ponzu sauce. The citrusy ponzu was meant for the white delicate fish served at each end of the dish. Unfortunately I forgot ask what they were. In the middle, there was Uni, Red Tuna, Salmon and Hamachi. All the fish was fresh and prepped well; nothing was a miss. 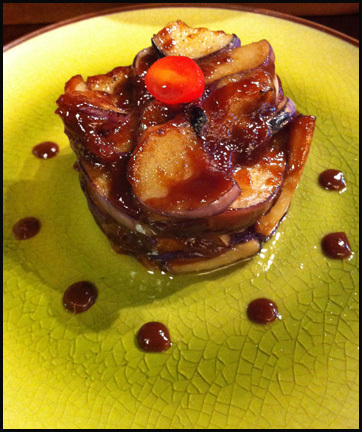 Next we got our Nasu Dengaku (miso glazed grilled eggplant) and it was plated nicely in a stack. The small pieces of eggplant were tender and worked well with the sweet miso sauce. The top half of the stack was more pleasant to eat, as we noticed small pools of oil forming at the bottom of the stack as the meal continued. The last few pieces become oil logged and were not tasty. Our assortment of nigiri and rolls came next. I selected Unagi, Saba, Hamachi and Tuna Toro for the nigiri. Perhaps catering the customers in the neighbourhood, I was a little disappointed that wasabi was not present underneath the fish in the nigri. All the raw fish was fresh and cut properly but I was particular interested in the saba & unagi. The unagi was sauced with a traditional sweet sauce and dusted with pepper. The eel was prepped well as it did not have a muddy taste. Saba spoils quickly and as a result sushi places cure it was salt and vinegar. It’s also not a fish that people commonly order in Vancouver since it does have a strong fish flavour and natural oiliness that may not appeal to all palates. As a result I have gotten mealy, way too sour and Saba that broke apart into chunks at not so good Sushi places. Hyoga presented a piece of Saba that was whole, firm with a slightly sour taste but the fish flavour still came thru. The fish was topped with finely minced ginger and sliced green onion to help offset the oily taste. Overall it was a nice piece of Saba nigiri. I rounded out my meal with 2 more inventive rolls: the Saba, shiso & ume hosso maki and a fusion roll called the Spicy Calamari. The Saba shiso roll was prepared well. The purple dollop of ume provided saltiness to the roll complementing the slightly tart saba and soapy tasting shiso. I liked the flavours that were in this maki. The spicy calamari roll featured crunchy deep fried squid as it filling. The squid was still crunch in the roll, tender for the most part but it didn’t impart any flavor. 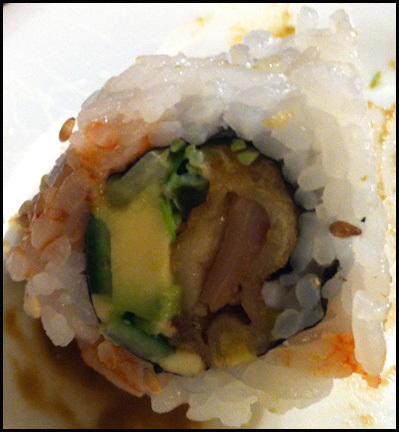 The roll relied on the creamy avocado and spicy sauce that was smeared on the outside of the roll for flavor. The roll was prepared well but I didn’t like how dull the flavours were. I always thought calamari might be interesting in a sushi roll. However after trying Hyoga’s version, I see why it may not be a good idea as the squid itself is very bland, so it would be challenging to pair it with flavourful ingredients without overwhelming the squid. Overall, there were positives about the dining experience at Hyoga (great presentation, fresh fish & wasabi, well prepared rice, maki and sashimi) but there were also a few negatives (limited and not very creative menu and greasy eggplant). I was learning towards writing a “Wow, you something there!” post for Hyoga but it wasn’t a slam dunk in my head and I was a bit unsure. I decided to turn Speedy for help by asking her one question, “Would you take your parents here if they were in town?” You see, Speedy is Japanese Canadian. When I began my food journey in Japanese cuisine 10 years ago, I always asked Speedy if she could take us to sushi places her parents would bring her as a kid. Speedy’s parents were very particular about where to dine when it came to Japanese cuisine; they wanted quality first and foremost and if it happen to be run by a Japanese staff even better. That’s how I learned about traditional Japanese items like Chawan Mushi (which Speedy dislikes) and how to know if rice was prepared properly because of Speedy and her parents. Since you are reading this post, I think you can guess how Speedy responded to my question. Speedy & her parents’ Wisdom:How to know the rice was formed properly for Nigiri. A piece of nigiri should hold its shape if you pick it up with a pair of chopsticks or your hand. If it falls apart, they did not form the rice properly. If you take a small chunk of rice from the nigiri and place it some soy sauce, the chunk should start to collapse on its own and separate into the individual grains of rice. 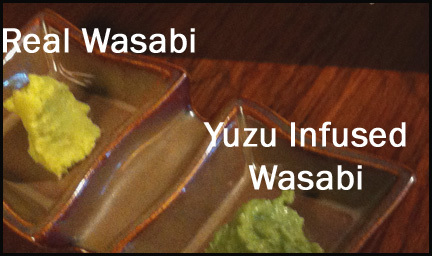 It means the chef incorporated enough air when forming the rice base for the nigiri and the rice was cooked properly. If it just sits there in a chunk, even with a gentle poke, the rice is overcooked and/or the chef formed the rice too densely. This leads to a gummy rice ball that you have chew quite a bite to breakdown which is not right. PLEASE do not eat the rice you tested, ‘cause that’s a little gross since the rice has now soaked in soy.